America's history is what has shaped her: her freedoms, her laws, and her lessons. Throughout her history, the military has played a large role in this development. While Savannah suffered incidents of destruction, there are still historically significant military sights in existence today, and military buffs from all over the United States still come to take in the atmosphere, sights, and to remind themselves of lessons learned through our military events. From her founding by British general James Edward Oglethorpe in 1733, to the British occupation during the American revolution, Civil War strife, and her ultimate survival of the blazing destruction that General William T. Sherman left in his wake on the way to our beautiful city, the city's past is both colorful and sometimes sad... but always interesting! A sure bet for the start of your historic tour is Savannah's History Museum. Here you can learn all about the different phases in the life here on the coast, and you can see a wide range of military artifacts including weapons, uniforms, and more. Follow Savannah's history to Fort Jackson. As the oldest brick fort still standing in the state, this fort was commissioned in 1808 by President Thomas Jefferson as a defense for our young country. Located on an old Revolution battery site, the structure was initially finished in 1812, although later additions helped improve the Fort. The Union Army captured Fort Jackson during the Civil War, and then fell into disuse after the War ended. 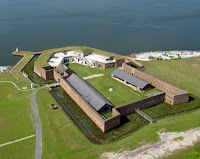 Fort Pulaski National Monument, located east of the city on Tybee Island, was completed in 1847. This impressive structure features walls that are 11 feet thick and the traditional moat that was such a deterrent to attack at the time. The fort was used by Confederate troops during the Civil War, but was overtaken after a long assault by Union troops using the then-new cannon artillery, causing a halt to shipping and prevented our city's prosper until the war ended. 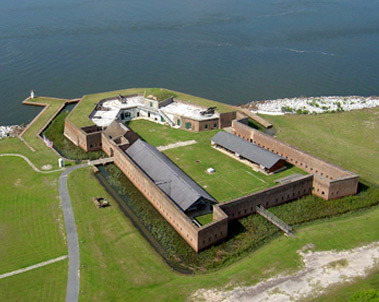 The Fort was used as a prison, both during the Civil War, and during the years after. The Fort McAllister State Historic Site in nearby Richmond Hill (10 miles south of the City's center) features incredible earthworks created by the Confederates in 1861. While the Fort was actively attacked by Union troops during the Civil War, much of the area has been preserved. Besides its historic significance, the fort is set in some of the prettiest surroundings amongst live oaks on the banks of the Ogeechee River. In the mid 1860's when General William T. Sherman occupied the city, he made his home (and headquarters) in the Green-Meldrim House on Macon Street here in the city. While this beautiful abode is currently used as St. John's Episcopal Church's parish house, tours are given on Tuesdays, Thursdays, Fridays, and Saturdays throughout most of the year. Finally, Fort Screven was built on the north end of Tybee Island in the late 1800s with the name Fort Tybee, as an additional defense for the country during the Spanish American War. It remained an active military location through both World Wars. The Fort was closed in the mid 1900s and was sold to Tybee as a historic site. What better way to enjoy a military sightseeing getaway than to stay at one of Savannah's historic bed and breakfasts? Each has an atmosphere guaranteed to set the perfect tone for your stay. Feel at home with award-winning hospitality and amenities to rival area hotels; and let your senses revel in the timeless beauty of our gorgeous inns.